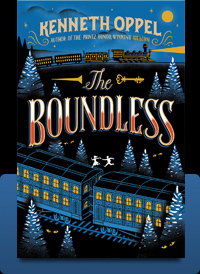 If you are looking for a book full of suspense and twists, read ‘The Boundless.’ The protagonist, William, is the son of a railroad worker. When the book opens the race to complete the railroad through the deep wilds of the United States is heated. The works is dangerous, the men are desperate, and William is caught in the madness of men seeking fortune, power, and immortality. While William waits for his father to come down off the mountain from his job laying train tracks, he stumbles upon a traveling circus. A cunning girl catches his eye and lodges herself in his heart for good. William lets her convince him to meet his father in the mountains. He can simply board the train going up and ride the train back down with his father. However, a simple plan rarely remains simple. William heads into the snowy mountains and is reunited with his father. As soon as he thinks he is safe and sound, the crew is about to drive the last stake into the track, his plans are destroyed. A bloodthirsty Sasquatch, a gold hungry railroad worker, and an intricate conspiracy take William on an untamed ride in unchartered territory. Part magical realism, with historical references to the first railroads, there is suspense on every page. It is thrilling, wild, and touching. Perfect for a 6th-8th grade reader looking for an adventure novel, with full adult appeal as well.